A lot of people pay much attention to decorating, designing and painting the interior of the house but forget to focus on the exterior. It is important to know that the exterior of your home is as important as the interior, in fact is more important as far as creating an impression on the onlookers is concerned. If you have an impressive exterior, chances are that your friends and relatives are half impressed without even stepping in. So why not take out time to do some homework before purchasing paints and other supplies for painting the exterior. Primary colors are also some of the color tones which are used by several people. This may make for a good color combination but at the same time, it is apt for those who are ready to go a little on the bolder side. Use blue on the exterior walls and roofing and paint your main door yellow for a slightly dramatic effect. This takes care both of rich depth as well as startling brightness. Make sure you don’t overdo the brightness and maintain the subtlety. Use wood for giving warmth to the exterior of your house. This will take care of one of the colors and has an advantage that you can add many colors along with it. You can go for deep gray, white, light yellow and even orange for contrast. 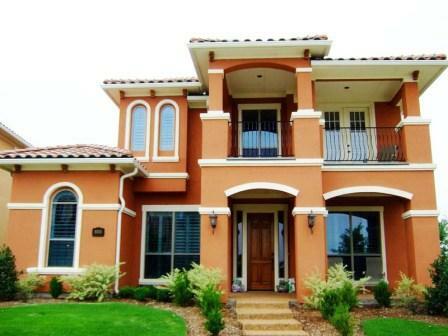 Another idea for coloring the exterior of your house is to use the variations of the same color for example lemon. Use light lemon on the exterior walls and its brighter shade on the roof for a subtle yet creative impact. To add a touch of fun here, choose a bright color for the door; Hint: maroon or red. Pastel shades too work wonderfully on the exterior of your house. Use colors like sea green with a combination of lush green. These colors look really soft and appealing. Compliment them by using similar shades on the interior. For example: a sea blue colored bathroom.